Dutch architect and designer Gerrit Rietveld's Zig-Zag Chair is the final entry in our alphabetical advent calendar of iconic chairs. The Zig-Zag Chair is formed of four flat wooden sections joined to create an angular form that appears fragile but is reinforced by clever joinery so it can support the sitter. It was designed by Rietveld in 1934 and represents a formal expression of the principles of abstraction advocated by the De Stijl artistic movement, which focused on basic forms and primary colours. The chair evolved from the designer's attempts to produce a functioning seat from a single continuous shape, which initially saw him experiment with materials such as bent plywood and steel plate. Solid wood was eventually determined as the most suitable material, and Rietveld employed the carpentry skills learned in the workshop of his joiner father to give the chair the required stability. Dovetail joints fix the backrest to the seat and two wedges fitted with dowels attach the angled support to the seat and base. The simplicity of the solution led Rietveld to describe the piece not as a chair but a "designer joke". From 1935 it was produced in different versions by Amsterdam furniture manufacturer Metz & Co.
Rietveld went on to use the chair in many of his later interior designs and also developed an armchair version and a children's highchair based on the same principle. 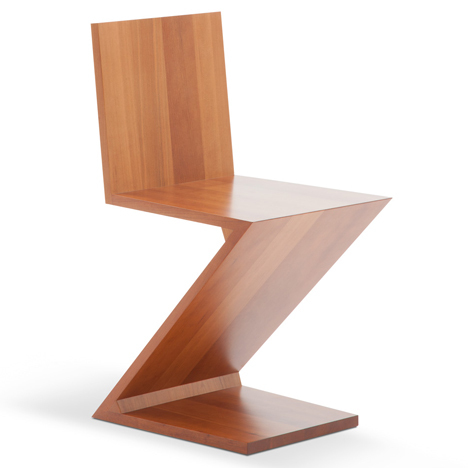 Italian furniture brand Cassina bought the rights to manufacture all of Rietveld's furniture designs in 1971 and offers the Zig-Zag Chair in natural cherry or ash, as well as in stained yellow, blue, red, black and white versions with an exposed natural wood edge. Earlier this year, another of Rietveld's classic designs – the Steltman chair – was reissued by Dutch furniture label Rietveld Originals to mark the 50th anniversary of its design.